What is an Automatic Transfer Switch (Power)? In response to the power redundancy article I wrote yesterday, a few comments came in. One of them (thanks, Mike!) 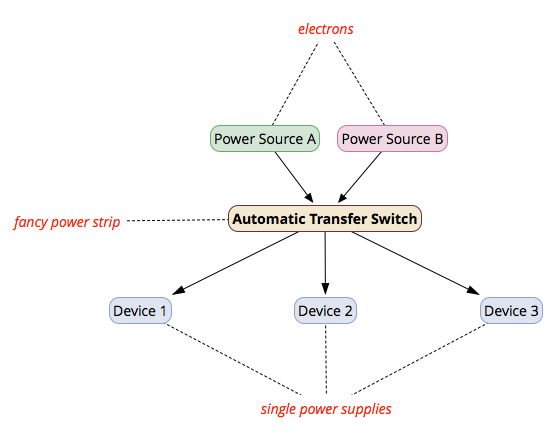 mentioned an automatic transfer switch (ATS), a useful tool in a redundant power strategy. As long as at least either Power Source A or Power Source B are supplying electrons to the Automatic Transfer Switch, the connected devices will remain powered. How does an ATS do this? An ATS accepts dual power sources in, and provides power out to the outlets. For devices that only have a single power supply, an ATS gives them a way to survive the failure of one power source. As long as one of the two power inputs feeding the ATS is live, the outlets will still have power. There’s enough circuitry inside the ATS that it can automatically detect loss of power on one feed and switch to the remaining feed; there is also enough electrical buffer (presumably in the form of capacitors, although I’m not 100% positive on that) in the ATS to ensure that the connected devices stay powered while the switchover occurs. In data center schemes, ATS strips are employed in-rack, sometimes in pairs where one ATS will be set to use power source A primarily, and the other power source B. This helps to keep load evenly distributed across the A and B power networks. A dual ATS scheme, where one ATS is primary to one power source, and another ATS to a different power source. This helps balances the load placed on each power source. 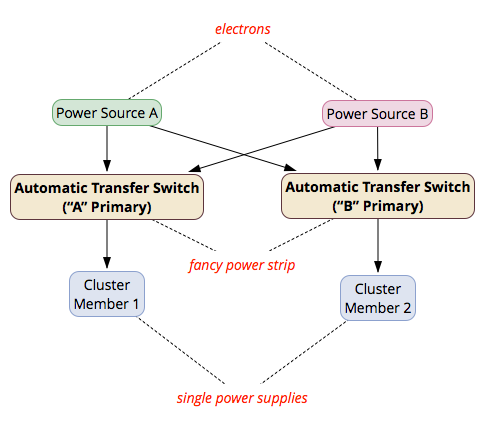 While this image implies identical cluster members, it’s helpful to load-balance between power sources in all cases. Also note that in the case of clustered devices, best practice is to *not* have both cluster members in the same rack if it can be avoided. This logic in this image works across multiple racks. If the dual “A-primary & B-primary” ATS units seem like overkill, realize that many data centers have devices that run as clustered pairs, while the hardware making up those pairs doesn’t have redundant power supplies. You might think that if a cluster member falls over due to a power failure, no big deal – that’s why the cluster exists. So why not just plug one cluster member into power source A and the other into power source B? Well, it’s sometimes desirable to keep all cluster members running and the cluster status stable if at all possible. Why? One of the unfortunate realities of running clustered anything is that devices joining to or being removed from the cluster and/or cluster member roles changing are potentially risky events that can impact traffic. That impact might be for a split-second, but in environments highly sensitive to data loss, even a split-second is noticeable. (Can I get an AMEN from the financial sector?? Hallelujah!) Thus, an ATS is used to help mitigate the risk of a power source failure for devices with single power supplies, even those that are the members of a clustered hardware pair. Of course, an ATS doesn’t help in the case of a power supply failure in the device itself…which, if it did, would be truly magical and deserving of a rainbow unicorn sticker. In the heavily virtualized world most data centers are moving towards, physical appliance concerns are less of an issue as virtual appliances rely on the underlying redundancy of the hypervisor and the metal it’s running on. Thus, as special-purpose hardware appliances give way to virtual appliances, I suspect ATS power strips could become less prevalent.